For those of you reading, you may not know Rob Lloyd, but he is an incredibly talented actor and comedian, and also a massive Doctor Who fan to boot! Born in New South Wales, Rob now lives in Melbourne where he has been on stage many times. Part of the comedy duo ‘InnesLloyd’, Rob has a passion for improvisation. Rob has found a great deal of success in the last few years, in 2013 his one man show enjoyed packed houses and rave reviews in Australia, so it took it overseas to Edinburgh, appearing in the Fringe Festival. Rob is now busy touring his latest show, ‘The Science of Doctor Who’, combining Doctor Who and science in a show doing the rounds in Australia. Rob help conceive and also hosts the show. He took time out of his busy schedule to answer a few questions from me. Andrew: Rob, how long have you been performing and what drew you to the stage? Rob: I’ve been performing professionally for over 13 years, ever since I moved to Melbourne in 2000, but I’ve been performing since I was 5 years old. It’s hard to explain what drew me to ‘the stage’, I remember I loved playing make-believe and dress-ups as a kid but I never really saw that as an actual job…I was to busy wanting to play for the Australian cricket team. However I remember at the end of Year 7 in 1990, we were given our list of subjects to choose for Year 8 and on that list was Drama. I thought to myself, ‘I can do make-believe as a subject?’ I decided then and there that’s what I wanted to do with the rest of my life. Andrew: Can you tell me a bit about your new show, ‘The Science of Doctor Who’. How it was conceived, the process of creating it and your role in the show? Rob: In The Science of Doctor Who I host the show with three scientists. 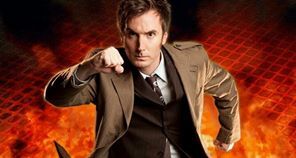 I introduce scientific theories explored in the TV show Doctor Who and the scientists explain whether they are possible or not. It’s also hugely interactive, audiences are encouraged to bring their mobile phones and tablets and answer certain questions that are placed on the huge screen. It all came about when RiAus, a science-communication based organization that I had previously worked with approached me to co-write and devise this show. Rob: I have done another ‘Who-based’ show. It’s a one-man, comedy show called WHO, ME. That show deals with my obsession with Doctor Who and I put the show on trial to see whether it is innocent or guilty of ruining my life. I’ve toured it all around Australia, New Zealand, and Edinburgh…hopefully to the US later this year. Andrew: How long have you been a Doctor Who fan and how did you become a fan? Rob: I got into Doctor Who quite late, when I was 17 at my first year of university…oh yeah…I know how to party. My closest friend at the time was dealing with a messy break-up and needed some distracting. So I got him to tell me about his favourite TV show Doctor Who. After that five hour conversation I knew everything about Doctor Who and I’ve been a fan ever since. Andrew: Can you tell the readers the details of your show? Dates, where to get tickets, plans to tour outside Australia and the like! Rob: The Science of Doctor Who is currently on its national tour. We kicked everything off in Perth last weekend (April 26th) next we’re off to Brisbane, Sydney, Adelaide then finally Melbourne. We’d love to tour it further, to other capitals in Australia, maybe even New Zealand or further…it just depends on the reaction to this initial tour. Andrew: If you could design ANOTHER Doctor Who themed show, what would it be about and what would it tackle? Rob: Well I’m actually working on a new show for the Melbourne Fringe Festival in September that does have ‘Who-connections’. It’s called Who Are You Supposed To Be? And it’s a romance comedy set at a Convention. She’s dressed as the 5th Doctor, he runs a website, blog, fan site. I originally saw it performed at Edinburgh Fringe last year and was asked to star in the Australian premiere. How could I refuse? Andrew: Thanks for your time Rob! See you on the stage!